Ceremonies are deeply embedded in the fabric of human experience. From the first stirrings of civilisation, all cultures have created ceremonies as the backdrop for acknowledging significant moments and life events. Most of us will participate in a ceremony at some point, be it focussed on birth or death, a time of significant change, transition or achievement. Ceremonies can transform our wounds and griefs and help us to cope with the hardest of times, as well as enable and empower us to dare, to step beyond imagined boundaries and become more than we ever thought possible. Through ceremony we experience a unity within ourselves, a deep connection with others and with the world around us. How we negotiate change often determines the extent of our future growth and our capacity to manage the gamut of life experiences that lie ahead of us. Ceremonies can be a helpful bridge of transition from one phase of our life to another. Creating and participating in ceremonies that mark these significant events helps us to rediscover and reconnect with the sacredness of life, affirm our values and beliefs and give meaning to our very personal experience of change. Such ceremonies provide an opportunity to embrace and integrate these times that have brought us immense joy or hurt... so that we might move forward with greater awareness, confidence and openness for future growth. My role is to ensure that your ceremony reflects YOU, most especially your beliefs, values and the things of life that matter most to you. As your celebrant I will work alongside you to co-create a deeply personal ceremony and one that is inclusive and respectful of all who participate or bear witness to it. 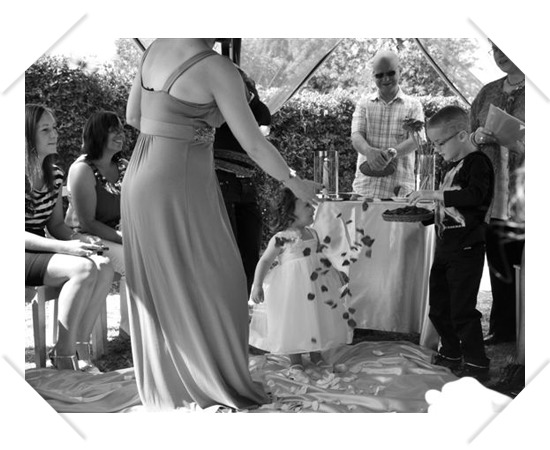 A well-crafted ceremony can open the hearts of many who take part in it. The richness of words and imagery, the use of symbolism to convey a sense of the sacred, reinforce a promise or underpin an important moment, all combine to capture what you most wish to express: your vision, your wishes, your ceremony, expressed in your way. "One day someone will walk into your life and make you realise why it never worked out with anyone else..."
Most couples who ask me to conduct their wedding or commitment ceremony are not religious. Nevertheless they often want to commit to something more meaningful than a purely legal (civil) contract. 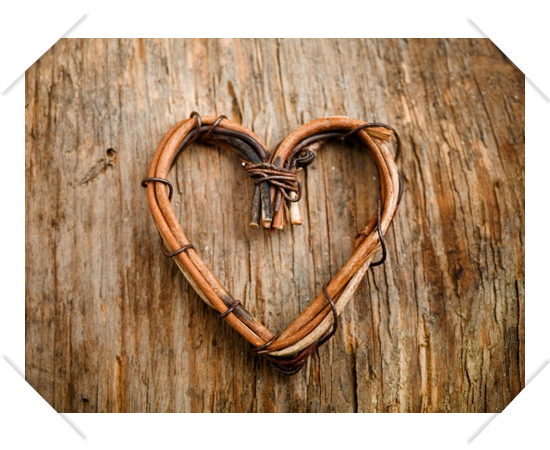 Many have a very real and personal sense of the 'spiritual' in their lives and they want their marriage to be bound by a contract of the heart, a sacred contract. And by this we mean something that is worthy of deep respect and deep honouring. Within the ceremonies I craft and conduct, this sense of the sacred is hugely powerful. It is created by the expression of your core beliefs and values, and by the things that matter most to you. It further reveals itself in the music you choose, the words you speak and the actions you make. From the voicing of personally written vows, to the exchange of rings and the sharing of the Quaich (a two-handled loving cup), the content of your ceremony becomes a sacred contract of your choosing. Added to this might be poignant readings by family or friends or elements drawn from the beautiful tradition of Handfasting. At the heart of the ceremony is your story. The story of how 'I' became 'We'. The story of two people coming home to each other. This is the wonder stuff of the heart. And when we share it we also inspire others to keep their hearts open to Love. This is your gift to them. We will work collaboratively to craft a wedding ceremony that recalls the journey you have taken together, to finally stand, ready, at this threshold of transition and commitment. The design and content of your ceremony will be true to your beliefs and values and inspired by the stories you share with me. 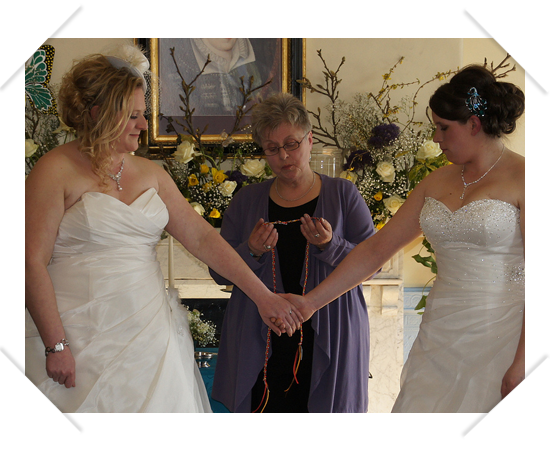 I adore the Handfasting ceremony, it is so richly symbolic and a joy to do. 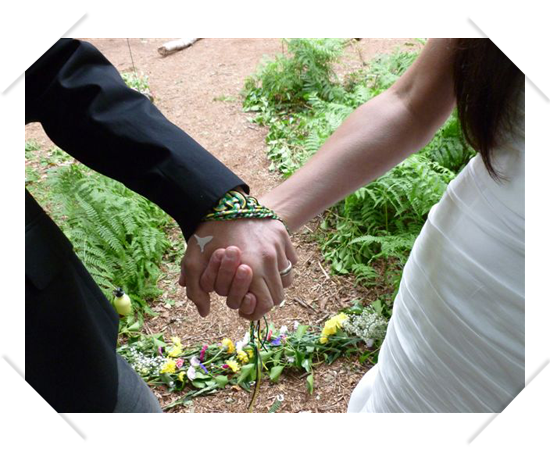 Handfasting is an ancient marriage tradition, thought to date back to the Celts. It continued right up until 17th century and still has legal standing in Scotland though not in England. The name arises both from the handshake used to seal a promise and the custom of binding the couple's hands together to express their commitment to each other. It comes from a time when the majority of couples could not afford the metals to make a ring so instead they would be bound together at the wrist with a piece of cloth, to symbolise the joining of their two life-forces. Some couples choose to be bound for a year and a day, others for eternity, or 'for as long as love lasts'. The Handfasting cords I use to bind your hands are braided from different colours. The colours are personally chosen by you. Each colour represents qualities you wish to weave into your union, for example the colour red represents the spark of life, passion, strength, love and courage. Whilst I consider myself green-spirited, I am not a Wiccan celebrant so the Handfasting ceremony I conduct is non-religious. It is however, deeply spiritual and respectfully honours Nature and the Circle of Life of which we are all a part. 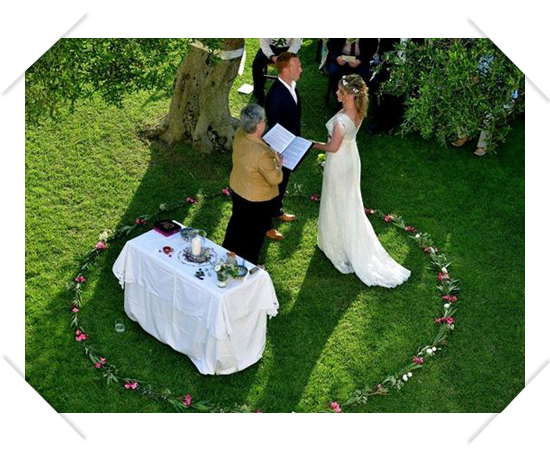 As well as the traditional binding of hands, this more contemporary Handfasting ceremony can also incorporate readings, personal vows or promises, the exchange of rings, sharing of the Quaich etc. Let me weave together a beautiful ceremony from the threads of your story and your design. A new life ... and the bestowing of a personal name worthy of it. Be it a name that has ancestral links or heritage, or a meaning you admire, perhaps a name that honours someone who has been an important part of your own life, or simply a name that you feel fits your new baby to a 'T'... A Naming Ceremony can express so much and is a wonderful way to welcome your unique and precious child to the world and the family s/he will be part of. 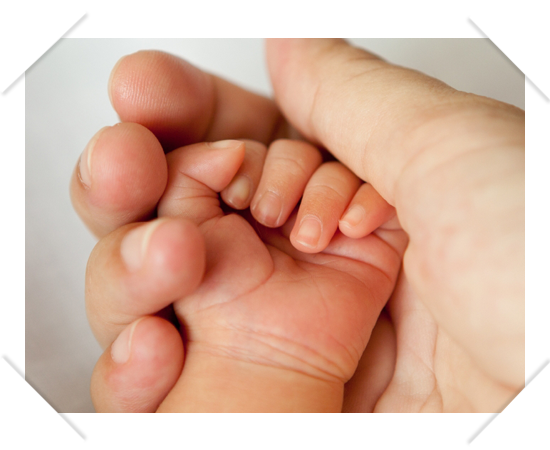 A Naming Ceremony is a non-religious alternative to the more traditional baptism, christening, bris etc and suitable for both birth children and children adopted into your family. The ceremony can be held at a location and time of your choice. There is no suggested age for your child to have a Naming Ceremony, this is left to you to choose what feels most appropriate. Most of us would agree that "it takes a village to raise a child" (African proverb) and a Naming Ceremony can be the most wonderful way to honour your child and to honour the collective effort of parents, extended family and friends who will be involved your child's upbringing. 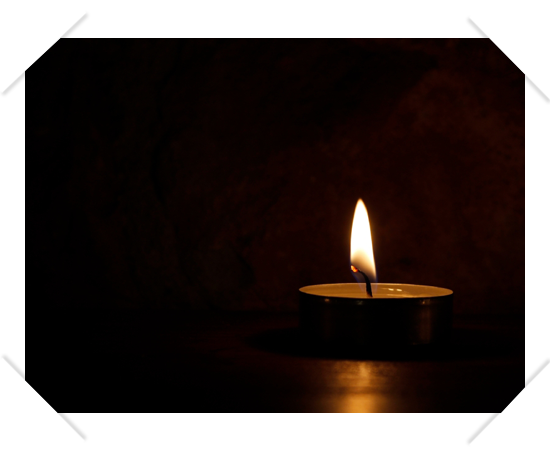 If you are arranging a funeral through a funeral director you will be asked what kind of service you want for the person who has died. This can be a delicate balancing act if some members of your family are religious, secular or interfaith. And what if the person who has died had a particular faith ... or none? How might this final farewell be a meaningful tribute to your loved one and also respect the values and wishes of all who have gathered? I've been to many funerals. Some have been wonderful honourings that have moved me deeply and uplifted my heart. Others have left me feeling uninvolved and disappointed that the life and personality of the person I knew and valued, had not been truly captured and acknowledged. We are all unique. There is no other person on the planet that is like me or you, nor ever will be. All lives have value, including those that may appear to have few redeeming qualities. My role is to listen deeply, impartially and with compassion. Your loved one's wishes (if known) and those of your family are paramount to making this ceremony of farewell a genuine reflection of the person who has died. From the stories and memories you share with me I compose a very personal and individual tribute, focussing on all that made your loved one unique, valued and special. Your tribute also expresses your gratitude and appreciation for a life lived, as well as acknowledging the sorrow death has brought. Moving to a new home is exciting... a new beginning with endless possibilities. Similarly, leaving a long established home where you have experienced many important personal events and forged warm memories is also hugely significant. Wherever we live, the beginnings and the endings are equally worthy of acknowledgement. 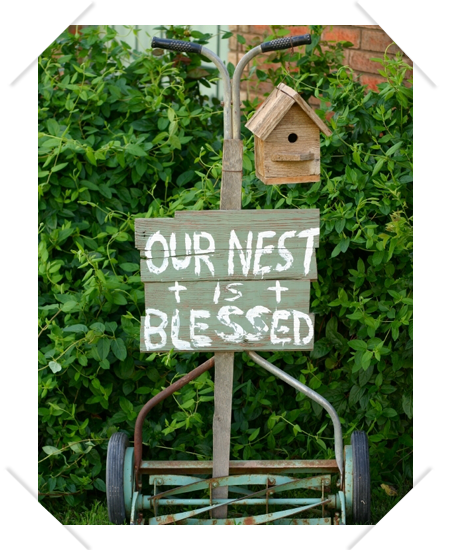 I can help you to honour these important occasions with a House Blessing ceremony that focuses your intentions and the hopes you hold for your new beginning and that welcomes and encourages happiness in to your new home. I can also craft a House Leaving ceremony that enables you to say goodbye and offer thanks and gratitude for all that has been memorable in the home you are leaving... before moving on to the next chapter of your life. 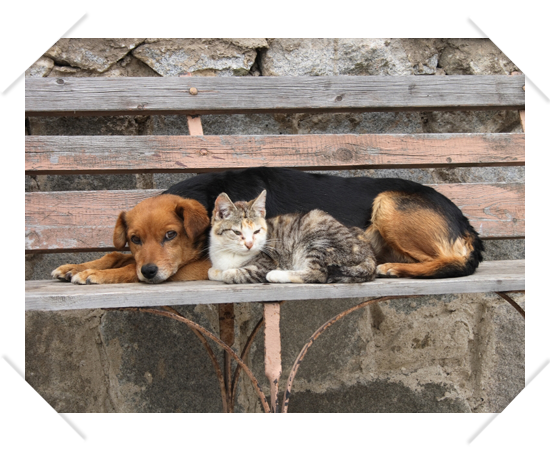 When a much loved pet dies, often both children and adults experience a huge sense of sadness. For many of us, the loss of our animal companion leaves an enormous gap in our daily lives. But unlike the passing of a person, we are generally left with no meaningful way to express all that our beloved pet had come to mean to us, nor how much they enhanced our life and well-being. 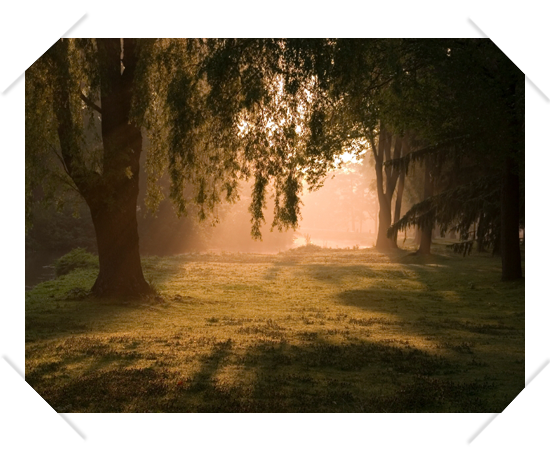 I will help you to create and conduct a ceremony that honours both the life of your animal friend and the special relationship you shared.